2008: VSCC 'Spring Start'. Last minute adjustment of skid-lid. 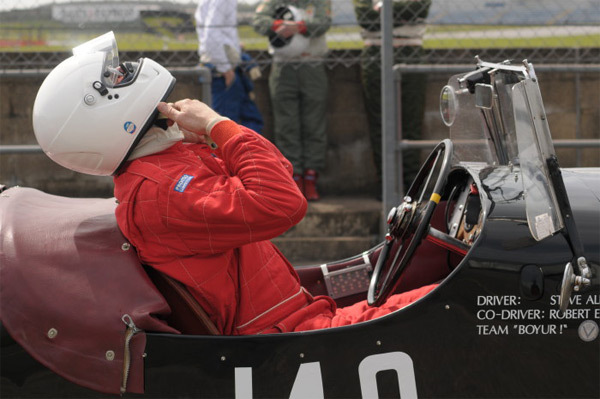 Safety equipment in vintage car racing is only mandatory for kill-switch, helmet, Nomex suits, towing pintel, non-powder fire extinguisher and general mechanical roadworthiness. Rollbars are distinctly non-vintage, and seatbelts are at driver's discretion - lap-belts have to be removed for car to be driven legally on the road. If seatbelts are fitted to a road-legal car, they must conform to BS specs - and lap-belts don't. Ffotographica.com - All images are copyright of Jasper Fforde 2008, unless otherwise credited.